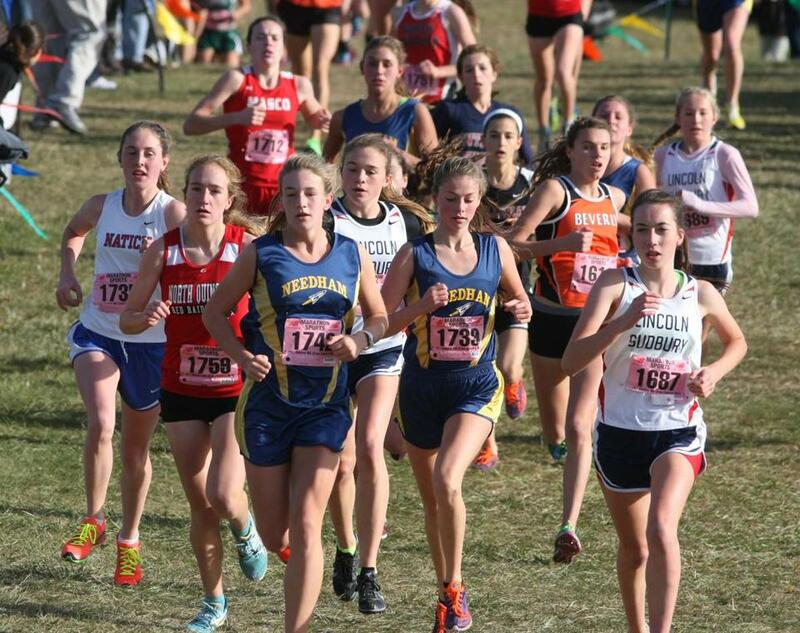 All-Scholastic’s Margie Cullen (left) and Sarah Armstrong (right) of Needham take charge early and are at the front of the pack during the Division 2 Eastern Mass. championship race. Still only a sophomore, Richards managed to sweep the Division 1 All-State championships (16:54) and the EMass Division 1 meet (18:17) this season. She finished first in the Merrimack Valley Conference meet and won the MVC 800 tuitle in track. Richards is also an honor roll student. Although it was her first season running cross-country, Lantz became the Division 2 All-State champion (16:56) and also won the Division 6 EMass title (18:13). The honor roll student led her team to the D6 EMass crown and she was the Cape Ann League champion. As a three-time Hopkinton MVP, Aarden led her team to second place at the Division 3 EMass meet, taking fourth place individually (18:36). A Tri-Valley All-Star, she has set the Tri-Valley League’s course record (19:07) and placed 8th in the Division 1 All-State championships (17:40). Armstrong’s fifth-place finishes at the EMass Division 2 meet (18:40) and the Division 1 All-State championships (17:35) helped Needham earn the title in both races. This was the second year she placed third in the Bay State Conference, and she is also an honor roll student. The Patriot League Champion placed fourth in the Division 1 All-State championships (17:29) and finished the season with a 5k personal best of 18:17. She also participates in winter and spring track, and is a member of the National Honor Society. Bryson hopes to run in college. As the runner up in the Division 2 EMass meet (18:03) as well as the Division 1 All-State championships (17:11), Clary contributed to Lincoln-Sudbury’s second-place team finishes. She was the Dual County League champion and has previously run a 5:08 mile as a personal best. Cullen led her team to victory in the Division 1 All-State meet with her third-place finish (17:25). She also was the Division 2 EMass winner for a second straight year and placed first in the Bay State Conference. She is also an honor roll student. The junior placed fifth at the Division 3 EMass meet in a personal best time (18:37), one reason Bishop Feehan went home with the team title. She finished 10th at the All-State championships (17:43), helping Bishop Feehan place third. Cutillo is an honor roll student. Dietz took home the Division 5 EMass title this season (18:24) and finished fourth in the Division 2 All-State meet (17:15). She placed second at the Dual County League championship. Dietz also runs track and is the former two mile All-State champion after running 10:38 last season. As the League’s MVP, Dominick was undefeated at dual meets and finished second at the Division 2 All-State championships (16:59). She won the Division 4 EMass title (17:56) and set a Danvers home course record. Dominick is also an honors student and is on the track team. Jahrling made it look easy in her first year running cross-country, becoming the EIL MVP. She also won the EIL championship race at Franklin Park while setting the league record at the course. She also plays squash and is interested in architecture. The Division 1 EMass champion (17:39) and former Division 2 All-State title holder set a school course record this season and a personal best as the winner of the Bob McIntyre Twilight meet (17:08). An honor roll student and repeat All-Scholastic, she will attend Stanford. Mussafer had an undefeated regular season, was the ISL champion, and came in fifth at Division 1 New Englands. She’s a five-time All-ISL selection and was selected as a captain for next year’s team. She also plays lacrosse. The two-time Patriot League All-Star was the runner up at the State Coaches Invitational (18:45) and placed seventh in the Division 1 All-State meet. Pearsons broke the school course record twice and is the highest All-State finisher in Silver Lake history. She is an honor roll student. The reigning Gatorade Outdoor Track Runner of the Year kept up the pace this fall. She was runner-up at Merrimack Valley Conference race, as well as at the Division 3 EMass championships. She was also first in the State Coaches Invitational Division 1 race. Zheng’s seventh-place finish in the Division 2 All-State championships helped lead Hamilton-Wenham to its team title. She also finished fourth in the Division 5 EMass meet (18:48), contributing to another team title. Zheng is an honor roll student and she runs indoor track in the winter. In her third year as head coach, O’Connell led Needham to their first Division 1 All-State title. This season her team was 11-0 and also won the Bay State Conference as well as the Division 1 Battle of the Border meet. Led by Sawyer, Hamilton-Wenham won All-State titles in 1999, 2000, 2008 and 2013. His team has won eight out of the last nine divisional titles and has been the Cape Ann champions for the past nine years. In 2005, Sawyer was inducted into the MSTCA Hall of Fame. Atlantic Coast — Dennis-Yarmouth: Orla Coughlin, Sydney McCann. Falmouth: Lauren O’Neil. Marshfield: Maddie Lawlor, Kate Spitler, Cecilia White. Nauset: Coralea Geraniotis, Callie Schadt. Plymouth North: Jordan Callahan, Kate Fisher, Leanne Galanek, Sophie Gorton. Sandwich: Kylie McCartney. Bay State — Milton: Mairead Dambruch, Colette O’Leary. Natick: Sarah Lagan. Needham: Sarah Armstrong, Margie Cullen, Katie Horton, Kaleigh Hughes, Sammy Lerner. Newton North: Maeve Greeley, Evie Heffernan, Sonya Jampel, Leah Metzger. Walpole: Jackie Applin, Allie Morris. Wellesley: Grace Rademacher. Weymouth: Ashley Betts, Kacie Higgins, Kelly Higgins, Katie Leahy. Big Three — Brockton: Sansha Alexis, Samantha Sinesi, Sarah Sinesi. Durfee: Megan Rockett. New Bedford: Brianna Amaral, Ellie Bucknell, Lisa Chan, Laura Vieira. Cape & Islands — Sturgis East: Katie Rheinhardt, Caroline Sullivan. Sturgis West: Claire Gilliland, Katie Kane, Nina Maruca. Cape Ann — Amesbury: Julia Shorter. Hamilton-Wenham: Amanda Burnett, Oliva Horgan, Meghan Stone, Jeanine Zheng. Manchester Essex: Fiona Davis, Olivia Lantz. Masconomet: Meghan Collins. North Reading: Nicole Roberts. Triton: Liz Willmonton. Catholic Central — Archbishop Williams: Jaclyn Shuttleworth. Arlington Catholic: Alexandra Kay, Olivia Liberti, Kaitlin McCauley, Kathleen McLaughlin, Veronica Seguin, Olivia Stewart. Austin Prep: Stephanie Cassaletti, Elizabeth Lombardo. Bishop Fenwick: Arianna Maida, Sydney Packard, Mary Pasquale. Cardinal Spellman: Molly Curtin, Abigail Gordon, Abby Hogan. Lowell Catholic: Emily Williams. Commonwealth — Chelsea: Wendy Becera. Greater Lawrence: Heidi Hernandez, Danisa Medina, Suheiry Pereyra, Carmen Rivera. Greater Lowell: Mariah Marrero. Minuteman: Gina Bellantoni, Julia Ruderman. Mystic Valley: Karina Hanson, Vanessa LoChirco. Essex Aggie: Alexa Marquis, Jessie O’Neill, Korina Rosario. Notre Dame (Tyngsborough): Eva Fandozzi, Carsyn Fisher, Abby French, Abbey Morelli, Maeve Norton, Anneka Paelinck. Whittier: Corinne Bilodeau, Anyelina Martinez. Dual County — Acton-Boxborough: Sara Mitchell. Bedford: Erin Dietz, Nicole Maclellan. Concord-Carlisle: Caitlin Lawlor, Emily Matheson. Lincoln-Sudbury: Alexa Babick, Brianna Bisson, Morgane Butler, Sydney Clary, Ariel Keklak. Newton South: Lucrecia Aguilar, Katherine Collins, Rebecca Grusby, Clare Martin. Wayland: Sarah Tully. Westford: Claire Widmann. Weston: Read Allen, Jillian Howard, Zoe Snow. Eastern Athletic — Bishop Feehan: Sara Amato, Megan Carmody, Jackie Cutillo, Elizabeth Hannon, Brynna Harum, Abigail McNulty, Adrienne Santoro, Kate Svenson. Bishop Stang: Theresa Gallagher. EIL — Beaver Country Day: Elizabeth Pohl. Concord Academy: Sophie Drew, Jolie Jacobs, Lindsay Klickstein. Dana Hall: Abigail Durfee, Caroline Jahrling. Newton Country Day: Abigail Hillerich, Mary Katherine Morrissey, Madeline Tango, Maeve Westover. Winsor: Katie Cronin, Sarah Goodman, Naomi Gordon, Talia Ruxin. Greater Boston — Cambridge: Martha Aschale, Maya Gunther, Maya Halprin-Adams. Malden: Victoria Hannafin, Deborah Kibazo, Joviana Morin, Gillian Willcox. Hockomock — Franklin: Caroline Knous, Nicole Mucciarone, Brittany Robinson. King Philip: Elizabeth Hilfrank, Katherine Lukes, Abby Seaberg, Lily Talerman. Mansfield: Sami Carey, Morgan Debolt, Julie Romano, Emily Sarkisian. North Attleborough: Katherine Loughnane, Jillian McAuliffe. Oliver Ames: Leah Flanagan, Emily Newman. Stoughton: Amy Kelly. ISL — BB&N: Natalie Madden. Governor’s Academy: Kathryn Hanlon. Groton: Addie Ewald. Middlesex: Mahal Alvarez-Backus, Helen Gallogly. Milton Academy: Minnie Stavis, Victoria White. Nobles: Melinda Edie, Olivia Mussafer. Rivers: Elizabeth Thayer. St. George’s: Mia DelRosso. St. Mark’s: Claire Benning. St. Paul’s: Samantha Yates. Thayer: Katherine Stanwood. Lighthouse — Cape Cod Academy: Marina Frayre. Mayflower — Bristol Aggie: Rebecca Broadbent, Hannah Rogers, Catherine Scaramossino. Diman: Sydnee Midura. Martha’s Vineyard: Julia Neville. Norfolk Aggie: Meaghan Hamilton. Sacred Heart: Maribeth Mason. West Bridgewater: Charlotte Allen, Savannah Climo, Carly Freitas, Abby McNulty, Ava Nardelli, Danielle Souza, Alison Wyman. Merrimack Valley — Andover: Leila Aruri. Billerica: Julie Schultz. Central Catholic: Tiffany Simione. Chelmsford: Casey Taylor. Dracut: Katie Colfer, Rachael Flores, Karina Shepard. Haverhill: Riley Gilmore. Lowell: Hannah Loughlin, Alexandra Richards, Kaley Richards, Marissa Richards. Methuen: Marwah Haq. North Andover: Danielle Voke. Middlesex — Belmont: Leah Brams, Julia Lenef. Burlington: Shauntel Farland. Lexington: Hannah Geller, Emma Houston, Grace Leightheiser, Olivia Manickas-Hill, Grace Vogelzang, Alex Wolf. Melrose: Elizabeth Hirsch. Reading: Justin Halley, Katie Mignosa. Stoneham: Meredith Coccoluto. Wakefield: Emily Curran, Maggie Gourville, Emily Hammond, Lucy Howard, Kelly Ledoux Walsh. Watertown: Leah Strangio, Tina Touri. Wilmington: Callie O’Connell. Woburn: Gina D’Addario, Katie Murray. Northeastern — Beverly: Nicole Demars, Abby Walsh. Danvers: Catalina Dominick. Marblehead: Janaya Randall, Lily Roberts. Peabody: Samantha Allen, Lauren Barrett, Antonia Pagliuca. Patriot — Duxbury: Heidi Strauss. Hanover: Stephanie Flynn. Hingham: Maggie McFarland, Julia Noble, Morgan Sullivan. Middleborough: Mary Cole, Liza French. North Quincy: Emily Bryson, Julia Bryson. Pembroke: Julie Debenedictus. Scituate: Jackie Coscia. Silver Lake: Anna Pearson. Whitman-Hanson: Sam Coletti, Megan Concannon, Caroline Mulrey, Abbie Newman, Kelsey Tierney. South Coast — Apponequet: Christina Brouwer. Bourne: Brianna Newell. Dighton-Rehoboth: Gracie Harrison. Fairhaven: Kacie Carvalho, Alexandra Charette, Bay Gammons. Old Rochester: Samantha Barrett, Emily Josephson, Hailey Saccone, Paige Santos, Rachel Scheub, Riley Shaughnessy. South Shore — Carver: Grace Chisholm, Ainsley Ryan, Priya Tait. East Bridgewater: Kerry Cullinan, Alicia Cutter, Cheryl Cutter, Jessica Jacobson, Emily Mulloy. Cohasset: Vivien Littlejohn, Carly Oremus. Norwell: Kelley Burtch, Anna Fairfield, Michaela Flaherty, Reilly Gilmore, Lexa Grasz, Lauren Humphreys, Kerry Shields. Tri-Valley — Dover-Sherborn: Michell Alessandro, Cayla Condon, Julia Pearson. Hopkinton: Shelby Aarden, MaryKate Cavanaugh, Lauren Hazzard, Melissa Lodge, Mary Paule Monks.